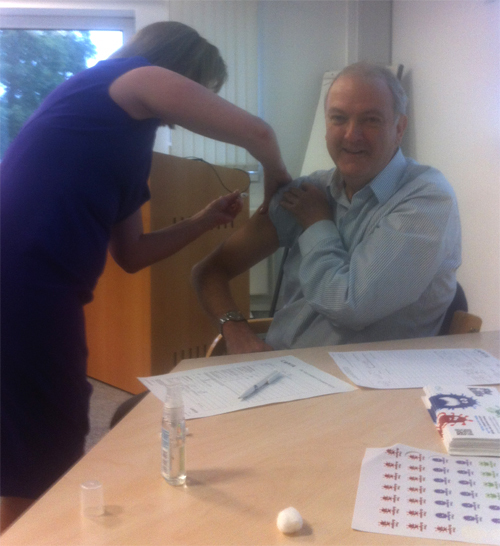 Sir Bruce Keogh, National Medical Director for the NHS Commissioning Board (NHS CB) was first in line for the flu jab at a recent all staff meeting at the NHS CB. “Every year thousands of people in England die from flu, but this can be substantially reduced by the right people having the flu jab. This includes NHS employees who have a duty to protect their patients and also their colleagues who are in contact with patients. For the majority of people who catch it flu is unpleasant, but for some it can lead to chest infections, severe complications and death. In 2010/2011, influenza was the cause of 602 deaths in England and 70% of fatal influenza cases occurred among people aged between 15 and 64. Globally, seasonal flu accounts for about three to five million causes of severe illness annually and between 250,000 and 500,000 deaths. For more information on the national seasonal flu campaign for NHS staff, visit the NHS Employers website.